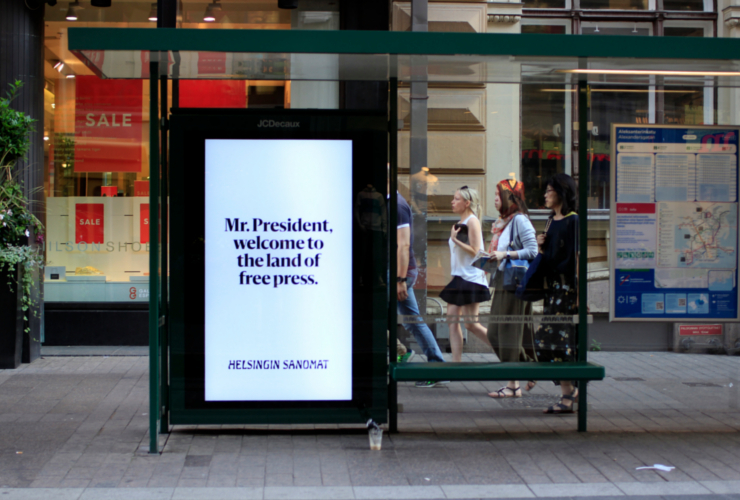 Posters supporting press freedom greeted Presidents Trump and Putin as they arrived in Helsinki for their July 16, 2018 summit. Photo: Helsingin Sanomat. Some 300 posters in English and Russian with headlines selected from previous editions of Finland’s Helsingin Sanomat, the largest newspaper by subscription in the Nordic region, will greet U.S. President Donald Trump and his Russian counterpart Vladimir Putin as they arrive in Helsinki for their much-anticipated summit today. “Welcome to the land of free press” trumpets one poster hanging in the arrival lounge of the Helsinki airport. Another poster at a bus stop on the route to the summit venue says: “Trump furious over leaks and blames media for complicating meeting with Putin”, a headline from Helsingin Sanomat on February 16, 2017. Similar headlines that appeared in the newspaper between 2000 and 2018 have been turned into posters all along the route. The newspaper’s editor-in-chief, Kaius Niemi, sits on the Executive Board of the International Press Institute (IPI), a global network of editors, media executives and journalists that was established in 1950 to promote press freedom. In a press release published today, Niemi described the campaign as a stand for press freedom. While press freedom has been largely dismantled in Russia since Putin came to power, in the United States, there is a constant battle between the independent media and Trump. The U.S. president regularly hits out at the media and often refers to media organizations as “the enemy of the people”. He has often described unflattering news reports as “fake news” and demonstrated his contempt towards a free press by taking to Twitter to smear media outlets and journalists. 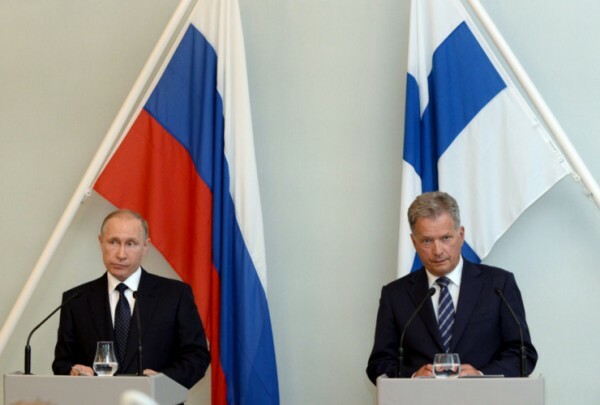 Helsingin Sanomat was founded in 1889 as Päivälehti and faced down political censorship by Russian authorities when Finland was under tsarist rule. The newspaper was repeatedly suspended and closed down in 1904. It was relaunched as Helsingin Sanomat by the same publishers a year later in 1905.